This class represents the concept of a variable name within the compiler (a shared container for the declaration of a variable (SgInitializedName)). Symbols are a simpler way for the compiler to quickly associate types, declarations and names. This symbol is specific to holding a variable name. Definition at line 344017 of file Cxx_Grammar.h. Cast function (from derived class to SgVariableSymbol pointer). 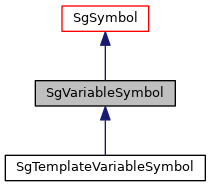 This functions returns a SgVariableSymbol pointer for any input of a pointer to an object derived from a SgVariableSymbol. Returns valid pointer to SgVariableSymbol if input is derived from a SgVariableSymbol.